Is there a better way to celebrate how far the Cuyahoga River (and Cleveland) has come since the June 22, 1969 fire than a run/walk of the Cuyahoga River trails followed by GREAT music and Fat Head's Brewery beer? We don't think so. 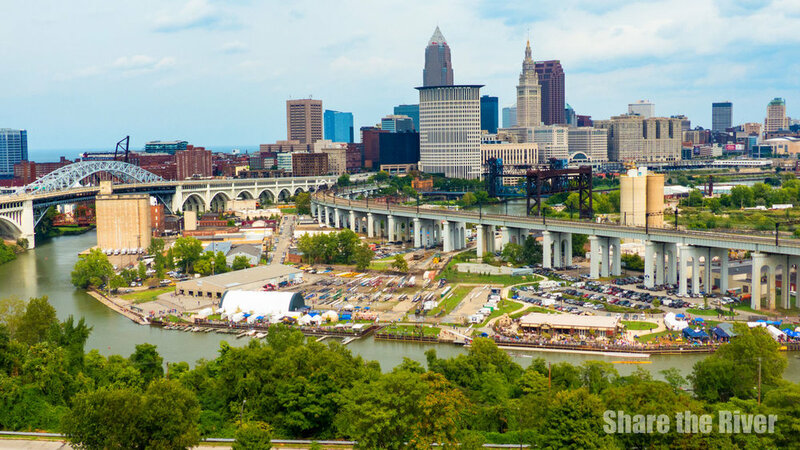 In case you haven't heard, the 2nd Annual Share the River Ramble starts at 4 p.m. Friday afternoon on the grounds of Cleveland Rowing Foundation (CRF) (1003 British St., Cleveland, OH 44113). At 5 p.m. DJ Red-I starts spinning her music. Brittany “DJ RED-I" is the beatmaker behind the all-female Cleveland hip-hop group “Fresh Produce” - She previously operated “Young Kings” Record shop in Hingetown, and now “Brittany’s Record Shop” in Slavic Village.. specializing in vintage vinyl Soul, Hip Hop and Reggae. Around 6:30 p.m. a 3.3 mile run/walk of the Cuyahoga River trails steps off just south of the Columbus Road bridge, transiting the Scranton Flats Towpath, the Cleveland Foundation Lake Link Centennial Trail, and the Red Line Greenway before finishing between CRF and Merwin's Wharf. Food trucks will be on-site to satisfy your gnosh needs: CLE Chicken, Sauced Wood Fired Pizza and Little Penguin Froyo. At 7 p..m. Ray Flanagan and The Authorities take the stage. They're a full band playing original music and covers of classic rock and blues rock. If you're a fan of groups like Tom Petty and The Heart Breakers or The Black Keys, you're gonna dig this show. Check out this review. At 9:15 p.m. Jul Big Green wraps the evening. An Akron based band lead by Julian Huntley, they’ve been playing northeast Ohio and steadily grown to become one of the top regional acts over the past three years. An eclectic band with influence from Pop, Funk and Hip Hop. Try not to dance, you won’t succeed. Would you expect anything less from our music programmer Thomas Fox? The following morning is Blazing Paddles, the first ever stand-up paddleboard race held on the birthplace of the environmental movement. The race for CASH prizes goes off the line at 9 a.m. off the Cleveland Rowing Foundations docks, heads up river 2.85 miles to the turnaround point at the Jefferson Ave. Bridge (which JUST happens to be the site of the 1952 Cuyahoga River fire, the BIG one), finishing in front of Cleveland Rowing Foundation. A parallel event, Surf & Turf, will be happening from 10 a.m. - 5 p.m. at Crooked River Skatepark with all ages skateboard lessons from 10 a.m. to noon, an open skate jam from 1 p.m. to 5 p.m. with music, raffle prizes, and giveaways. 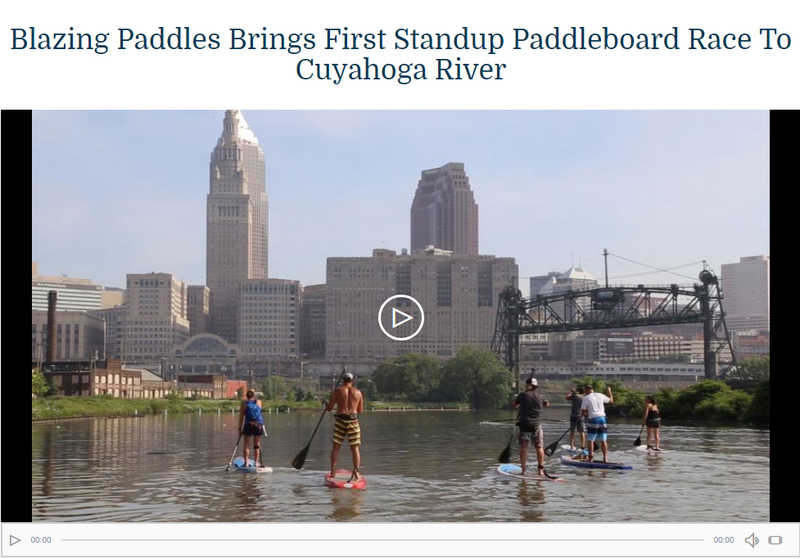 Check Out This Great WVIZ Story on Blazing Paddles! University Hospitals EMS is making sure our event will be a safe one with their kind provisioning of services for both the Ramble and Blazing Paddles. UH has a clear commitment to the community and this falls perfectly in line with their mission.